What is Castile Soap? First, let me get this out of the way. I’m going to say straight up from the beginning, so that we are clear, I am in LOVE with castile soap. 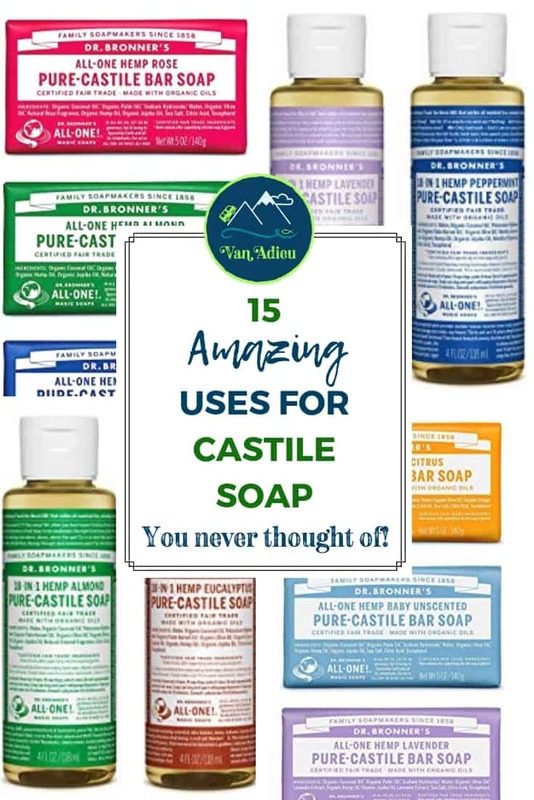 I have always been in love with castile soap, and I will always be in love with castille soap. Now, if you know Dr. Bronner’s castile soap products, then I’m not talking to you, because you already know how amazing they are. You can go browse our articles about the fact that We Have A Van!, or how ticks are nature’s nightmare. If you know Dr. Bronner’s pure castile soap, then you love Dr. Bronner’s soap. I’m talking to those of you who may not have heard of this wonderful product. They believe in Constructive Capitalism, and using business as a force for good in the world, and making the Earth a better place than where you left it. Good stuff, Dr. Bronner, good stuff. The company is structured after the 6 principles that guide Dr. Bronner’s All-One mission, the report’s chapters focus on the company’s commitment to: Work hard and grow, do right by customers, treat employees like family, be fair to suppliers, treat the earth like home, and fund and fight for what’s right! What is castile soap? Castile liquid (or solid) soap is an organic, natural soap. It can be used literally for anything. Sure, it’s the best soap you can get to wash yourself. Fine, no one is arguing that. But castile soap is also a shampoo. Yes, we use castile soap for hair! But wait, there’s more! It will clean a mountain bike. And we use it diluted to clean our produce. We use it to clean bathrooms, countertops, cars, fruit, (yes, fruit! ), pets, laundry, dishes. You name it, and we use it to clean that too. Other uses you never thought of? Ants. Yes, ants. You can use the tea tree castile soap to make a diluted spray to prevent ants from coming and hanging out. What about shaving cream? The oil in the soap will make the razor easily glide across your face and legs and reduce the chances of razor burn. Take some and spray your plants and use as a Plant Spray that is both a fungicide and a natural insecticide! The peppermint or eucalyptus castile soaps can be used as a sinus helper. Just fill a large bowl or your sink with super hot water, and pour a few drops in. Lean over and breathe, with a towel over your head! Use the tea tree soap for shampoo as a lice preventor! There are absolutely NO synthetic preservatives, detergents or foaming agents. And as the Dr. Bronner’s castile liquid soap bottle always says: Dilute! Dilute! Ok!! Want some recipes? Of course you do. There are the Liquid Soaps Dilutions Cheat Sheet. And here’s even a printable one. You’re welcome. The label itself is awesome, and about the best entertainment you can get reading the label of any product. Don’t believe me? See for yourself. Go ahead. I’ll wait. It’s just that good. 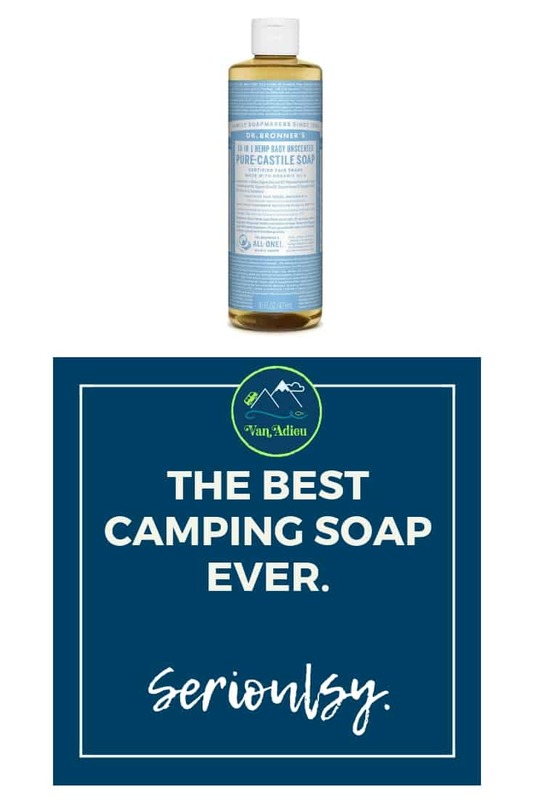 Best Natural Soap for Camping. Ever. You see where I’m going with this, right? I mean, now that you know what castile soap is, you get it, right? You can use this for everything. Cleaning, bathing, anything. Castile soap is literally a wonder and a miracle, and on top of all of that, castile soap is an all organic and natural soap. My favorite is the one shown at the top, which is the Baby Unscented. Why? Because (wait for it…..) it’s NOT scented! 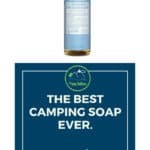 That means this Dr. Bronner’s soap is fantastic for camping (no enticing smells for bears!) and if you REALLY want to (and I do) you can add any essential oil to it like lavender, tea tree, etc! It’s amazing like that. And while they have citrus, lavender, tea tree, eucalyptus, almond, peppermint and more, the kind we use most often is the baby unscented. We use it for laundry or hand soap, or use it just plan for our face and body. It works great for people who have keratosis pilaris or other skin conditions as well, and for those that have allergies or sensitive skin, like our daughter. Ok, so maybe you want the scents I mentioned above! No worries! You’ve got Peppermint, Citrus, Almond, Lavender, Eucalyptus, and Rose! Oh, and Dr. Bronner’s castile soap is Fair Trade, did I mention that? Amazing. Mic Drop. Enough Said! Remember our guide to gifts for hikers and adventurers? Well, we should add this to the list, because you can even give a gift set of Dr. Bronners pure castile bar soap. This gift set is sampler of all the soaps in bar form. Again, amazing. Talk about making the holidays awesome. If you can’t tell by now, I am in love with this soap, and can not recommend it enough. Not just for camping, but for every day use. We literally use it all the time. Every day. Did I mention that it was inexpensive as well? Well, it is. So, hurry and go grab yourself some today. There are solid bars, and even gallon drums of it, but the kind that we use are the 32 oz liquid castile soap containers. And while they have citrus, lavender, tea tree, eucalyptus, almond, peppermint and more, the kind we use most often is the baby unscented. We can add a few drops of essential oil to it for laundry or hand soap, or use it just plan for our face and body. It works great for people who have keratosis pilaris or other skin conditions as well, and for those that have allergies or sensitive skin, like our daughter. We put them in Glass Pump Bottles and then use essential oils to make a bunch of “flavors!” Hint, Hint – get the Glass Pump Bottles, the Essential Oils, and some Unscented Dr. Brommers along with the other soap bar gift set, and you have an AMAZING Christmas gift! 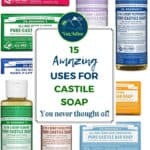 Now that you know what Castile Soap is…. So, tell me the truth. Did I convince you to try this out? I mean, who writes a WHOLE. BLOG. POST. about soap? Me. That’s who, because I love Dr. Bronner’s castile soap, and I have always thought it was so amazing! 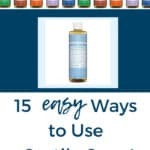 If you really want to know where to buy liquid castile soap, then you can click on any of the links below! Tell me you are already a Dr. Bronner user, or if you decided to go purchase it after this article. If you did, I would love to hear your comments below! Tell us all about it! The Vault is full of EXCLUSIVE tutorials, printables, and downloads for van conversion, and outdoor resources & inspiration! *We promise never to spam you, or sell your information. You are all kinds of awesome for joining us here at Van Adieu! 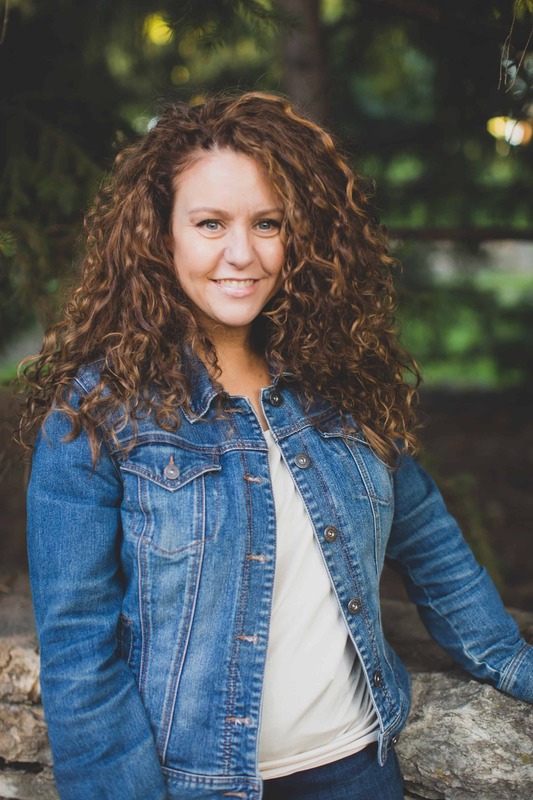 I’m Annette, and I provide outdoor resources and inspiration for the amateur adventurer! Todd is my husband, and is crushing it on our Sprinter Van Conversion Project! You can learn more about us here. We are so glad you stopped by, because seriously, I’ve always liked you. Hey you! We would love to hear from you! Connect with us on Facebook, Pinterest, and YouTube! 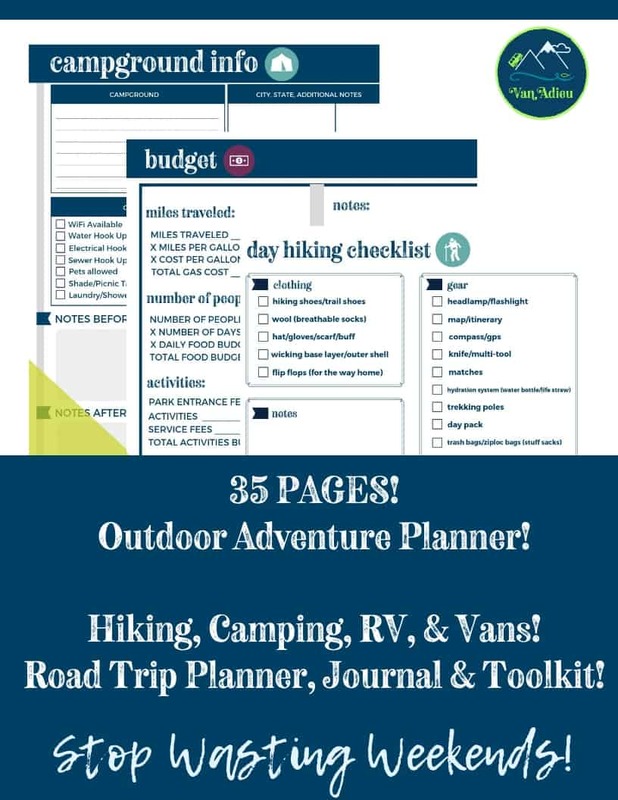 Checklists, Maps & Itineraries for National Parks and Road Trips! Resources on Van Conversion and #VanLife! ​Weekly Adieu Crew News! Freebies, tips, and more just for you!